A digitally-coloured microflower magnified 20,000 times. Researchers at RMIT University in Melbourne, Australia, have developed artificial microflowers that self-assemble in water and mimic the natural blooming process. 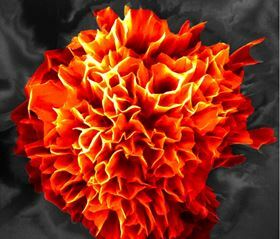 The distinctive surfaces of these flower-shaped structures could prove of use in a range of fields, including catalysis, non-wetting materials, explosives detection, magnetic materials, biomedicine and optoelectronics. The team from the RMIT-Indian Institute of Chemical Technology Research Centre has for the first time developed microstructures shaped like flowers that assemble through self-repeating arrangement in water. They produced the flower-shaped structures by mixing two organic components (naphthalene diimide-bearing phosphonic acid and melamine) in water, which they then evaporate away. The artificial microflowers take about three hours to fully develop, mimicking the way natural flowers bloom. Lead investigator Sheshanath Boshanale said the field of organic flower-shaped morphology was still in its infancy. “This is the first time flower-shaped microforms have been developed in a water solution, opening an exciting new pathway for further research,” he said. Finding new electrode materials for next-generation batteries is essential for energy research. Scientists have developed nanomaterials that can self-assemble, reconfigure and disassemble in response to biochemical signals.